If you were on an island and could only bring 3 things, what would you bring? JK: My iPod, maybe a travel guitar and the confirmation number for my travel home. 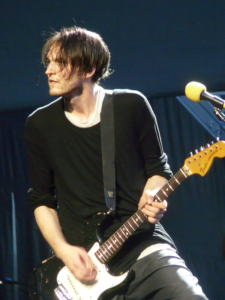 Josh Adam Klinghoffer was born on October 3rd, 1979 in Santa Monica, California [source] but his family lived in Canoga Park at the time. They moved to Northridge in the San Fernando Valley around 1987 when Josh was about to start third grade. He later attended Granada Hills (Charter) High School in ninth and tenth grade but left early in the eleventh grade. Little is known publicly about his childhood years; he liked hockey [source] as a young child but as a teenager he lost interest in sport and he only got back into them when he toured with Gnarls Barkley and realized how much he knew about them from his youth. Music was pretty much Josh’s emphasis in life. What was the first piece of music that you fell in love with growing up? Wow. I don’t know if it’s the first, but I remember scouring New York City for a 45rpm record of the Chariots Of Fire theme. I was probably 5 or 6. Around that time, I was also fascinated with the song Footloose. Zimbio: Okay, general fun questions: What was the first album you ever bought? JK: I don’t know ’cause my dad always had a lot of records around. It might even be like Appetite for Destruction. Maybe The Beatles’ Help! That’s probably the first one I went to the store and made them get me. JK: Metallica [and also Guns N’ Roses*] at the LA Colosseum. That was the first one my friends and I got our parents to take us to. I did see the Beach Boys at Yankee Stadium in the mid-’80s. [*Josh’s family home in Canoga Park was a stone’s throw from where GNR’s Appetite For Destruction was recorded]. Interviewer: When growing up, when becoming a musician were there any particular musicians that you kind of looked to, to get inspired. Any particular guitarists that influenced you more than others? However, his is parents weren’t happy with this decision and during an argument with them about it, Josh broke his first guitar after slamming it down. (The guitar was repaired when he joined RHCP and he used it on I’m With You before donating it to the Rock ‘N’ Roll Hall of Fame. Source: YouTube interview; 2016). At the age of 17, Klinghoffer joined Bob Forrest’s band, The Bicycle Thief- Josh was a friend of Forrest’s girlfriend’s younger brother [source]. Over the next several months, the duo began working on Forrest’s songs and then went into the studio together. Even though this was Klinghoffer’s first-ever recording experience, he ended up playing most of the instruments — guitars, keyboards, and several of the drum tracks. Through his time with The Bicycle Thief, Josh met John Frusciante and their friendship began. Another poignant fact from this time was that Josh was to open for the Red Hot Chili Peppers when The Bicycle Thief toured with them as their opening act in 2000. Over the next few years, Josh was to be involved with the musical projects of John Frusciante. In 2002 they began writing together on what was to become Frusciante’s solo release, Shadows Collide with People. Klinghoffer continued to work with Frusciante and contributed to The Will to Death, Inside of Emptiness, and A Sphere in the Heart of Silence (as well as 2009’s The Empyrean]. Another collaboration between Klinghoffer and Frusciante along with Joe Lally (bassist of Fugazi) was known as Ataxia and saw the release of two albums, 2004’s Autmomatic Writing and AWII in 2007. In fact, 2004 was a very busy year for Klinghoffer as in addition to the solo Frusciante and Ataxia work, Josh also appeared on California Clam Chowder with former band mate Bob Forrest in his latest studio album with Thelonious Monster. Between 2006 and 2008, Klinghoffer was a touring and session musician for Gnarls Barkley. 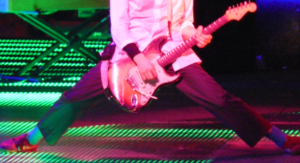 He appeared on the band’s second album, 2008’s The Odd Couple and was part of the band’s touring line-up – a position which saw him once again in an opening act for the Red Hot Chili Peppers on their Stadium Arcadium tour and during 2007 Josh was to join the Chili Peppers on the latter part of their Stadium Arcadium tour as a supporting musician. Klinghoffer has also toured and/or recorded with PJ Harvey, Beck, Warpaint, Sparks, Golden Shoulders, Perry Ferrell, Gemma Hayes, Paul Oakenfold and Tricky among others. Zimbio: Dot Hacker is a group of really talented musicians best known for working with extremely famous people. How did you find each other? Josh Klinghoffer: I met Clint, the other guitar player, when we were touring together with Gnarls Barkley in ’06, and we sort of quickly became really good friends and talked about always wanting a band—he has a band, but I never really did, so we talked about trying to pull it together, if we could. I met Eric through him, and I introduced him to Jonathan, who I had met when he was touring with the band Hella. Coming out of California, I had known those guys for a long time. We just kind of threw it together and it worked instantly. Josh has continued to front Dot Hacker alongside his Chili Pepper commitments when time allows. The band’s first album, Inhibition, was released in 2012, with two albums ‘How’s Your Process (Work)‘ and ‘How’s Your Process (Play)‘ released separately in 2014.The band have played live a few times but touring has to fit around the commandments of the various band members so is limited. What was it like when you did get that phone call [about being in RHCP]? 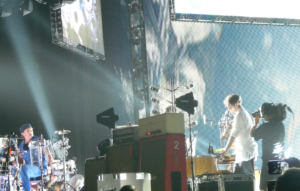 Josh Klinghoffer: It was shocking and exciting and kind of a beautiful moment. I was at a baseball game [talks about the teams]… it was July when Flea called me and we didn’t actually get a chance to play together until October. So Flea made the call? Josh Klinghoffer: Yes, Flea made the call. Josh first appeared with members of the Chili Peppers in May 2009 at the 5th Annual MusiCares MAP Fund Benefit where Anthony Kiedis was honoured with the ‘Stevie Ray Vaughan Award’ for his support to the MusiCares MAP Fund. 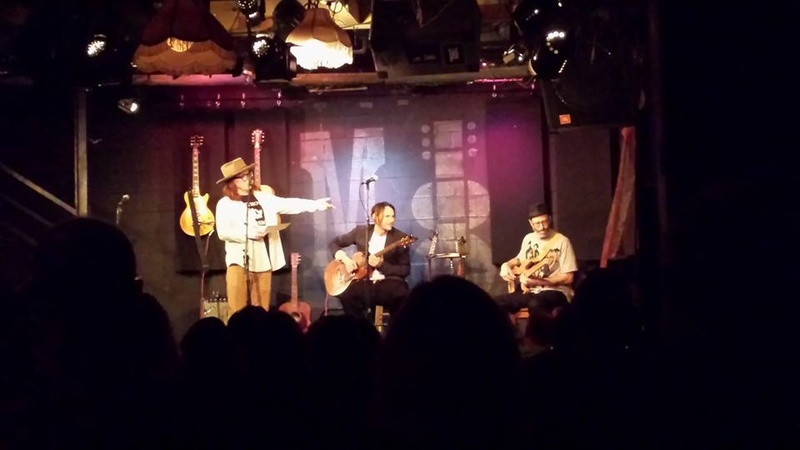 Anthony, Chad and Flea from RHCP played and they were joined by Josh Klinghoffer among others including Bob Forrest and Ron Wood under the name of The Insects. Frusciante was not present. 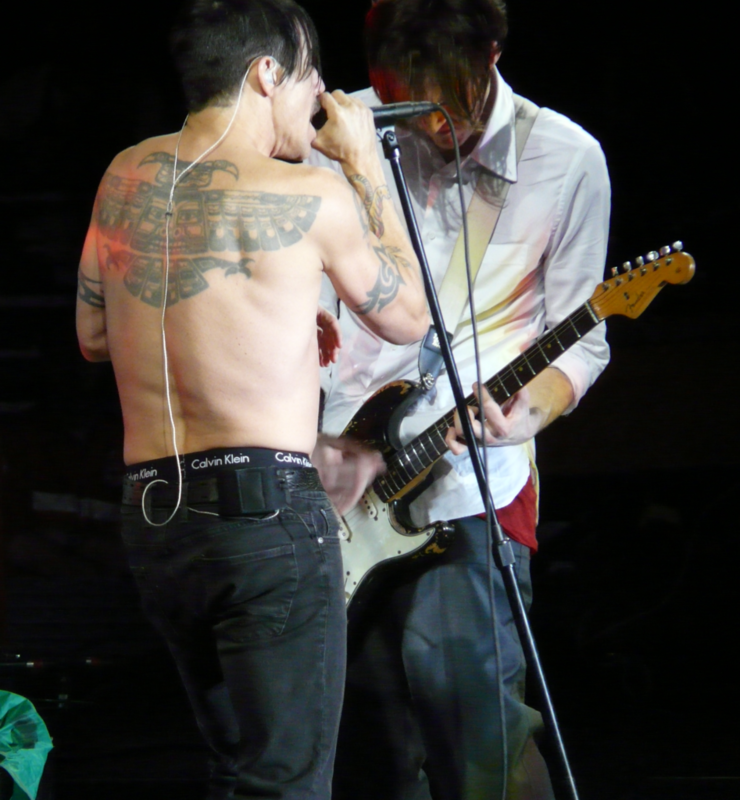 In January 2010, Klinghoffer joined the RHCP proper on stage for the first time as their guitarist. They performed a cover of Neil Young’s “A Man Needs a Maid” at a MusiCares tribute evening to Young. Josh’s first album with the Chili Peppers was 2011’s I’m With You – which Josh actually named when he wrote those three words onto a piece of paper and slipped them to his band mates [source]. He toured with the band on their world tour supporting the album. In 2016, the band released their second album with Klinghoffer entitled The Getaway and they are currently promoting that album on another world tour. In April 2012, Klinghoffer became the youngest ever inductee of the Rock and Roll Hall of Fame at the age of 32, when he was inducted as a member of the Red Hot Chili Peppers. You’ve mentioned in another interview that you used to focus on your songwriting and lyrics before joining the Chili Peppers. Once you joined, you had to focus on your chops again, because the music is so technical and aggressive. How has your approach to the instrument changed? Yeah, I definitely approach it differently just because time has moved on and I’ve listened to a ton of different music, and I think about things differently. Since recording or writing with Dot Hacker, I’ve just played a lot more guitar by being in the Chili Peppers. Doing a year’s worth of songwriting and jamming, and getting to know Flea and Chad as musicians. Just spending hours touching the guitar, which is something I hadn’t really done in a long time. When I was focusing on songwriting, I played the guitar a little bit, and I would write on guitar. But I was doing a lot of piano writing, and synthesizer programmer— just getting sounds and constructing songs from that direction. I wasn’t focused on being technical on the guitar at all. I think I never really had until I joined the Chili Peppers. For me, when I started playing with the Chili Peppers, I think that was my biggest fear—that John was so technically proficient, and such an amazing guitar player and I’m a different kind of guitar player and always have been. I loved playing songs that he wrote, and I just hoped that people weren’t expecting someone to come in and do exactly the same thing. Zimbio: Have you suffered injuries in the name of rock?